SHAH ALAM, Malaysia -- A police witness said Monday that the estranged half brother of North Korea's leader met with an unidentified Korean American man on a Malaysian resort island four days before he was murdered, as the trial of two women accused of killing him resumed. Indonesia's Siti Aisyah, 25, and Vietnam's Doan Thi Huong, 29, are accused of smearing VX nerve agent on Kim Jong Nam's face in a crowded airport terminal in Kuala Lumpur last Feb. 13. They pleaded not guilty to murder charges when their trial began Oct. 2. The two are the only suspects in custody, though prosecutors have said four North Koreans who fled the country were also involved. VX is universally banned and classified as a weapon of mass destruction by the United Nations. Its use against Kim shows the capabilities -- and the resolve -- of his killers, CBS News correspondent Adriana Diaz reported in November. 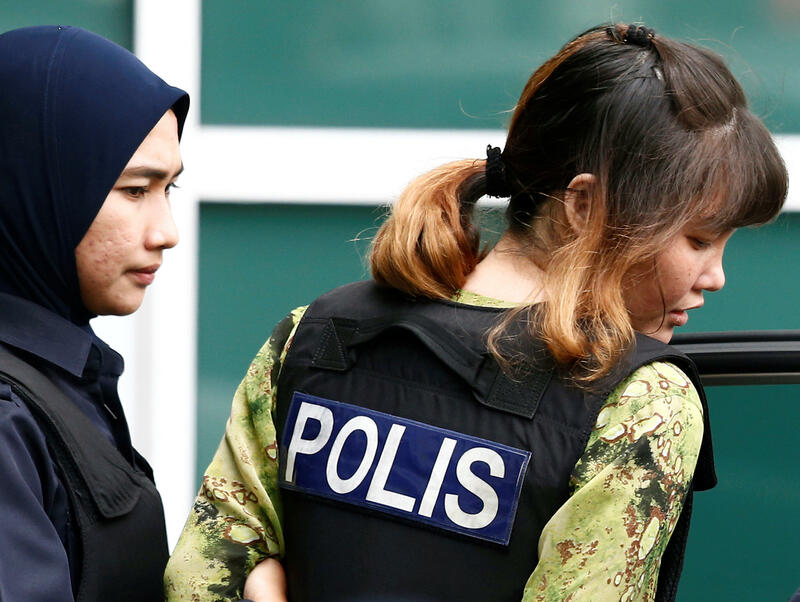 Chief police investigating officer Wan Azirul Nizam Che Wan Aziz told the court Monday that Kim flew from Macau to Kuala Lumpur last Feb. 6 and went to the northern island of Langkawi two days later. He said Kim met with the Korean American at a Langkawi hotel the next day, but he didn't know the man's identity and it wasn't related to the $138,000 in cash found in Kim's backpack when he was murdered. Wah Azirul was responding to questions from Gooi Soon Seng, Aisyah's lawyer, who asked him to confirm a report by the Japanese newspaper Asahi Shimbun that Kim had met in Langkawi with a U.S. intelligence agent who was based in Bangkok. "Until now, the identity of the man is not known," Wan Azirul told the court. He said he could not remember the hotel name or whether the room was registered under Kim or the man, prompting a lashing from Gooi for his "severe lapse of memory." Wan Azirul said an analysis of Kim's laptop showed it was last used on Feb. 9. He said Kim returned to Kuala Lumpur on Feb. 12, a day before he was killed while waiting for a flight back to Macau. The trial is to resume Tuesday. Gooi has told reporters that Kim's killing was likely a political assassination because of involvement by the North Korean Embassy. A police witness has testified that a car used to take the North Korean suspects to the airport on the day of the murder belonged to the embassy. The court also heard that an embassy official met the suspects before they fled and facilitated their check-in at the airport. If they are convicted, the two women could face the death penalty, but not if they lacked intent to kill. Defense lawyers say the women believed they were playing a prank for a hidden-camera TV show. Prosecutors contend the women knew they were handling poison. Kim, the eldest son in the family that has ruled North Korea since its founding, had been living abroad for years after falling out of favor. It is thought he could have been seen as a threat to the rule of his half brother, Kim Jong Un. Malaysian officials have never officially accused North Korea of involvement in Kim's death and have made it clear they don't want the trial politicized.